English Pantomime, as a recognisable and unique theatrical style, developed in London during the early years of the eighteenth century. Unlike the preceding Italian Commedia dell’Arte style of theatre it was largely based on songs, music, mime and dance, rather than spoken dialogue. In fact it provided the principal outlet for theatre dance throughout the eighteenth century. The word itself was coined by John Weaver to describe his Loves of Mars and Venus (1717): “an entertainment in music and dancing in imitation of the pantomimes of the ancient Greeks and Romans”, in which the story was told purely in dance and mime, without words. Under the impresario John Rich, pantomime developed into a very popular theatrical form, often combining the telling of some Classical legend of Gods and Goddesses from Greek mythology, with comic or bawdy interludes involving Harlequin and Columbine, or other characters from the Commedia dell’Arte. Only in the following century did it adopt the familiar nursery-tale themes and become primarily a children’s Christmas-time entertainment. Although often derided, Pantomime held its own throughout the eighteenth century alongside Ballad Opera and other forms of musical theatre. It was ‘serious’ adult theatre, often on serious themes (though usually treated as farce) and of great significance to the economics of the theatrical companies themselves. Its emphasis was on spectacle – with clever tricks, rapid scene changes, lavish sets and costumes – and in this respect the role of the ‘magician’, whether Harlequin or Faustus, was paramount. The late 17th and early 18th centuries witnessed great popular interest in farce or pantomime versions of the tale of Dr Faustus. These generally followed the story as told in the so-called English Faust Book rather than Marlowe’s dramatic version (which had, of course, the same origin). EFB appeared in print as a chapbook in 1592, very soon after the publication of the German original in 1587. It was not long before the story was exploited for its comic or sensational potential by groups of comedians. It is generally believed that troupes of ‘English Comedians’ later took the story back to Germany during the 17th century. Their move abroad may have been the result of censorship or pressure upon the English theatre by Puritan forces (which in the end forced a complete closure until after the Restoration and provided further impetus for the development of puppet theatre). This tradition continued well into the eighteenth and even nineteenth century. The puppet plays were particularly popular in Germany and are said to have influenced or inspired Goethe to write his own great epic version. Among the earliest published of the comic versions is Mountfort’s The Life and Death of Dr Faustus, Made into a Farce, .. with Harlequin and Scaramouche (1697). This incorporation of Commedia dell’Arte characters continued with The Necromancer or Harlequin Dr Faustus, produced by John Rich at his Lincoln Inn Fields theatre in 1723 (with music by Johann Ernst Galliard) and John Thurmond’s Harlequin Dr Faustus (music by Henry Carey) at the rival Drury Lane theatre the same year. Several later pantomimes extend the story to include the doings of Faustus’ student apprentice (The Miser or Wagner and Abericock (1726), and Harlequin’s Triumph (1727), in both of which Harlequin appears as the student apprentice Wagner). This tradition of Faustus pantomimes continued well into the century, with performances recorded even in the 1770s, by which time pantomime itself had changed to more closely resemble its modern form (though that process was not really complete until the 19th century). There were a number of famous fairs held during the year in London, including Bartholomew and Southwark. The latter generally ran for two weeks in September, although pressure from indignant locals, antagonised by the licentiousness they encouraged, was always trying to reduce it to just three days. From its early beginnings as a trade fair founded in 1462 it became increasingly an entertainment fair rather than one for the exchange of goods and services. An important part of this entertainment, along with the rope dancers, performing animals and card sharps, were the 'drolls'. These were short plays, generally on patriotic or historic themes. They took place in specially built temporary play booths, often attached to taverns. Several are illustrated in Hogarth's famous picture of Southwark Fair (173 1), including The Siege of Troy. A version of the Harlequin Dr Faustus pantomime is also known to have been performed at Southwark Fair in 1737. A notable feature of these productions was the 'parade' or balcony erected in front of the play booth on which the actors would present snippets of the play or the characters in order to entice the customers inside. Despite (or possibly because of) their licentious reputation, attendance at the Fair was from a wide class of people. The Prince Regent is known to have visited on several occasions during the 1730s. The moralists finally prevailed, however, and the annual fair at Southwark closed for the last time in September 1762. Among the familiar characters at any of these fairs would be the 'quack doctor' or nostrum vendor. Many of these are likely to have been of foreign origin -- several engravings show a 'High German Doctor' plying his trade at a 17th century London fair. The appeal of 'foreign medicine' over the (equally dubious) virtues of the local variety may have been similar to the cult of exotic herbal remedies from far-off lands today. One consequence of a non-English speaking nostrum seller is the need for a front-man to act as intermediary. The role was often filled by a Harlequin or Merry Andrew character, well-used to drumming up an audience from a reluctant or sceptical public. The figure of the quack doctor was frequently satirized by the commedia players in the form of the ‘Doctor’ character, a bumbling fool with pretensions far beyond his true intellectual ability. Parallels between this and Faustus himself have long been recognized and were probably explicit in early farce versions of the tale. The music for our present version has been taken from several contemporary pantomime sources. We have used Rich’s The Necromancer or Harlequin Dr Faustus (1723) for several of the main airs. These were composed by J.E. Galliard – yet another German immigrant to London. He arrived in London in 1706, worked as a professional oboist in the theatre and achieved considerable success as Rich’s preferred composer from 1717 on. The theme of the Masque of Deities, however has been cribbed from the rival pantomime of Harlequin Dr Faustus produced in the same year by Thurmond at Drury Lane (The Necromancer has a different masque, featuring Hero and Leander). 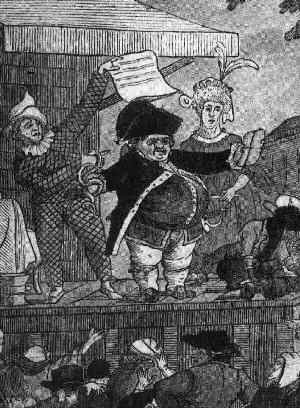 Other sources for the music are the Comic Tunes that invariably accompanied the pantomimes (and were generally published along with the principal airs and plot descriptions) and traditional tunes of the period, which were often published as Broadside Ballads, or re-cycled in Ballad Operas such as the Beggars Opera. In the best traditions of the period, however, we have not hesitated to change the words to fit better with the telling of our story. Along with the pantomime sources, we have used several of the dance descriptions from Lambranzi’s Neue und Curieuse Theatrialische Tanz-Schul (published in 1716)), together with published or manuscript choreographies from contemporary sources for dances from French operas of this period. Ideas for costume (and even characters) have to some extent been taken from the engravings of William Hogarth, which provide an incredibly rich source of information about London theatre and street life in this period. The story, however, while using the basic plot of the Faustus legend (and several rather obvious cribs from Marlowe and other sources) has been developed in a way that fits better with our own dramatic sensibilities and the inevitable constraints of working in a modern concert hall rather than true 18th century theatre, with its flying chariots, wave machines, numerous trap-doors and other devices. The existing text descriptions of the original pantomimes are barely more than a list of tricks and transformations. Their execution would severely tax the resources of a major theatre, let alone the tiny performing group that is Chalemie. On the other hand, by making a virtue of our limitations, we hope to get rather closer to the true feeling of 18th century theatre than might be possible in a more conventional or literally correct approach.